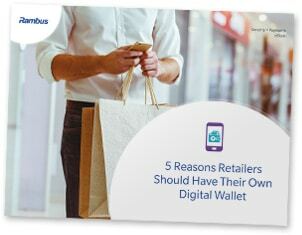 ‘Five reasons retailers should have their own digital wallet’ begins by explaining why retailers should consider deploying a digital wallet as a new and powerful way to engage with consumers. It then identifies five advantages of doing so, including improving security and mitigating risk, minimising transaction fees, enhancing the customer experience with value added services, streamlining checkout and the adding the ability to digitise physical cards and receipts. The paper then explores augmented reality and personalised shopping experiences in physical stores as well as in-aisle payment solutions, and provides an overview of how retailers can address and deliver on security while maintaining usability for the customer. This white paper has been produced and sponsored by Rambus and has been approved by the NFC World editorial team. This 11-page document is available free of charge to NFC World Knowledge Centre members (PDF format, 3.5MB).